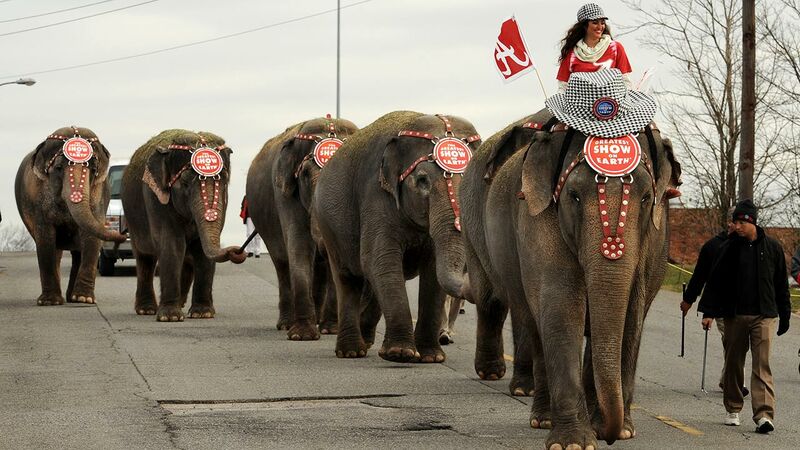 ST. PETERSBURG, FL -- The Ringling Bros. and Barnum & Bailey Circus is ending its elephant acts a year and a half early, and will retire all of its touring elephants in May. The move comes amid increasing scrutiny of circus elephant acts with local governments passing "anti-circus" and "anti-elephant" ordinances in response to concerns over animal cruelty. The circus's parent company, Feld Entertainment, told The Associated Press exclusively that all of the iconic elephants will be permanently retired to the company's 200-acre Center for Elephant Conservation, located between Orlando and Tampa. The company announced in March that it would retire the full herd to the center by 2018. But once officials began planning details, they realized "we could actually do this a lot sooner" because building the new structures to house the retiring elephants didn't take as long as they originally thought, said Alana Feld, Ringling's executive vice president and show producer. It costs about $65,000 yearly to care for each elephant, Feld said. Eleven elephants currently tour with the circus. "They'll be joining the rest of the herd," Feld said. She's part of the family that owns Feld Entertainment, which owns the largest herd of Asian elephants in North America. In addition to the elephants still touring, 29 of the animals are on the property now, and two are on breeding loans to zoos, Feld said. Animal rights groups on Monday applauded Ringling's new timeline and announcement. "Like the elephants themselves, it had outsized importance because of the symbolic value of the enterprise," wrote Wayne Pacelle, president and CEO of The Humane Society of the United States. "Ringling had been one of the biggest defenders of this kind of archaic animal exploitation, and the imminent end of its traveling elephant acts signaled that even one of the most tough-minded and hardened animal-use companies now recognized that the world is changing and it had to adapt." But because so many cities and counties have passed "anti-circus" and "anti-elephant" ordinances, it became difficult to organize tours of three traveling circuses to 115 cities each year, Feld Entertainment CEO Kenneth Feld said last year. Fighting legislation in each jurisdiction is expensive, he said. Ringling's new show will begin in July without the giant pachyderms. "We're looking at a lot of new ways of doing things," Feld said. She said the retired elephants at the CEC will also be part of cancer research. Cancer is much less common in elephants than in humans, even though the big animals' bodies have many more cells. That's a paradox known among scientists, and now researchers think they may have an explanation - one they say might someday lead to new ways to protect people from cancer. Compared with just one copy in humans, elephants' cells contain 20 copies of a major cancer-suppressing gene, two teams of scientists reported in October. The gene helps damaged cells repair themselves or self-destruct when exposed to cancer-causing substances. The findings aren't proof that those extra p53 genes make elephants cancer-resistant, but if future research confirms it, scientists could try to develop drugs for humans that would mimic the effect. Dr. Joshua Schiffman, a pediatric cancer specialist at the University of Utah, is one of the researchers trying to find clues in the blood samples of some of the Ringling elephants. "There's so much to be learned from their DNA," Feld said. On Monday, Ingrid Newkirk, the president of People for the Ethical Treatment of Animals, called on Ringling to end all animal acts and that "vigilance will be needed to determine how they are treated" at the Florida sanctuary.